Punk Rock Parents: Why is Uncle Matty delivering my baby? Why is Uncle Matty delivering my baby? So we all know about the drama and the horror I went through with my last doctor. Well the switch has been made (and without the $405 deposit!). Last week I saw my new doctor for the first time. He was awesome. He stayed with me for well over half an hour. He answered every question I had. He even asked me a lot of questions. He told me I was measuring great. Told me not to worry about the lack of weight gain (still have only gained 1 pound...total!). He told me I could stop taking the diabetes classes because, and these are his words, "you could teach the class". He let me listen to the heartbeat and even told me what the heart-rate was (144). He had me get a H1N1 vaccine which my old doctor had never even mentioned before. The man even gave me the name of a new pediatric allergist for The Phi after I asked about allergy prevention for Sweet B. It was a great visit. In fact it was almost perfect. When it comes to the lady business I usually stick with female doctors. I think it stems back to one of my first Gyno appointments. I was probably 17 and still in high school so I went to the same Gyno that my Mom went to. During the exam, yes while he was down there he said "You are Mercy's daughter. You look a lot like your Mom" WHILE HE WAS DOWN THERE! I know he meant that my face looks like my Mom, well I hope he did anyway. It was still weird. So when I got pregnant with Sweet B I looked for a private female doctor and as well all know that ended in disaster. This time when they gave me a male I really didn't care. I just wanted a good doctor, male or female. 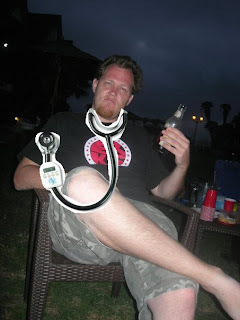 photo of Uncle Matty posing as a doctor. This should make the deliver interesting, when the drugs kick in and I am yelling "Why is Matty delivering my baby?" I'll tell you why: cuz I went to college longer than most doctors. Oh, that is too funny! Definitely get video! Wow, this doc sounds great. I really did laugh out loud about the Uncle Matty thing. I'm really happy he had you get the H1N1 vaccine, and that he recommended a pediatric allergist. I, too, always look for a female doc, with me, it's a feminist thing, and also, when you remember how old I am, ancient, I got tired of the asses talking down to me. I am feeling good. I had some soreness in my arm after the injection but that was it! how did you get away with out giving the 405 deposit?